It’s Christmas at Fawlty Towers, but Basil’s finding it a challenge to get into the Christmas spirit: He booked a father Christmas who hasn’t turned up (and Manuel is a very poor substitute); there’s rat poison on the turkey so he has to turn to a local chef for help (while keeping the health inspector at bay); he still hasn’t hung the decorations despite promising Sybil it would be done before dinner; and to make things worse, there’s a German Christmas Market taking place next door. As long as no one mentions the war, surely everything will go smoothly…? 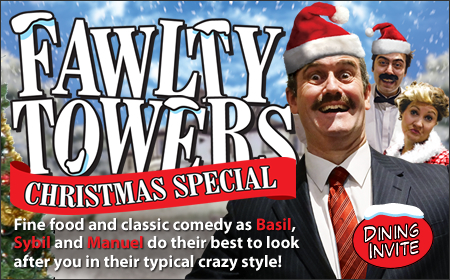 Join Basil, Sybil and Manuel for a hilarious seasonal celebration featuring favourite moments from the TV series with a special Christmas twist.